There was a interesting post „MVC – Model View Controller, Minimum Viable Code“ from master DJ Adams, which did the groundwork for this article. I will call it UI5 One Pager instead of minimum viable code technique. So the idea behind is to have a UI5 MVC template with which you can quickly try or test something with UI5 MVC concept. Everything (Bootstrap, View, Model and Controller) in one single page/file, but still a full-grown ui5 mvc app. 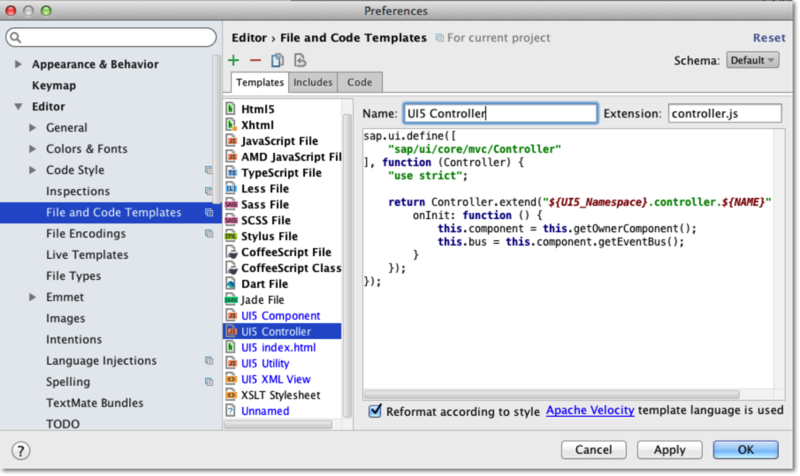 To add something useful to the existing code, let’s provide the UI5 One Pager as File Template for JetBrains WebStorm (my favorite Web IDE) and also use the new UI5 module concept (AMD – Asyncronous Module Definition), which is propagated since v1.28/v1.30 of OpenUI5/SAPUI5. WebStorm is one of the best IDE for web development (at least JetBRAINS is able to charge for it). With some dedicated UI5 file templates it is quite handy to start with UI5 development. I will also introduce AMD module definition concept which has found his way in OpenUI5/SAPUI5. With version 1.28 of OpenUI5 a new module concept is propagated. In the core classes of UI5 it is already used much longer. The code templates which will be introduced below will already be based in this concept.